It looks like Sony’s previous PS4 promotion, which bundled a full year of PlayStation Plus in with the console and a digital copy of The Last of Us Remastered, has ended at most retailers now. 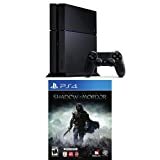 In its place, at Amazon at least, is a two bundle deal which includes a physical copy of Middle Earth: Shadow of Mordor along with the digital copy of The Last of Us Remastered and the console. Not a bad deal for those looking to jump into a PS4 with either of those (quality) releases. Head on over to Amazon to pick up the bundle, here.